Amazing view of the Gray hawk golf course adjacent to Isabella's voted one of the best patios in Scottsdale. Beautiful 2 bedroom, 2 bathroom condo located within walking distance to DC Ranch Marketplace and the public Gray hawk Country Club. The condo has just been redecorated with brand new furniture and linens from Restoration Hardware. The master bedroom has a king size bed . The master bath has 2 sinks, a glass shower and a Jacuzzi bathtub. There is a walk in closet in the master bedroom. There is a beautiful patio off of the master bedroom where you can read or enjoy your morning coffee. The second bedroom has a queen size bed with a full bath adjacent to the bedroom. The kitchen is fully stocked so all you will need to do is buy groceries. It is very private as there is no one above or below you. The best part is the view from the porch off of the great room. It is amazing all times of the day! There is a table on the patio to enjoy your meals and chairs to relax after a fun filled day in Scottsdale. Condo is set up so you don't need to worry about anything but enjoying the pool, spa, gym. 36 hole public golf course, and miles of walking trails outside your door. The property is also close to the 101 Loop and to DC Ranch marketplace with great restaurants, shops, Starbucks and grocery stores. 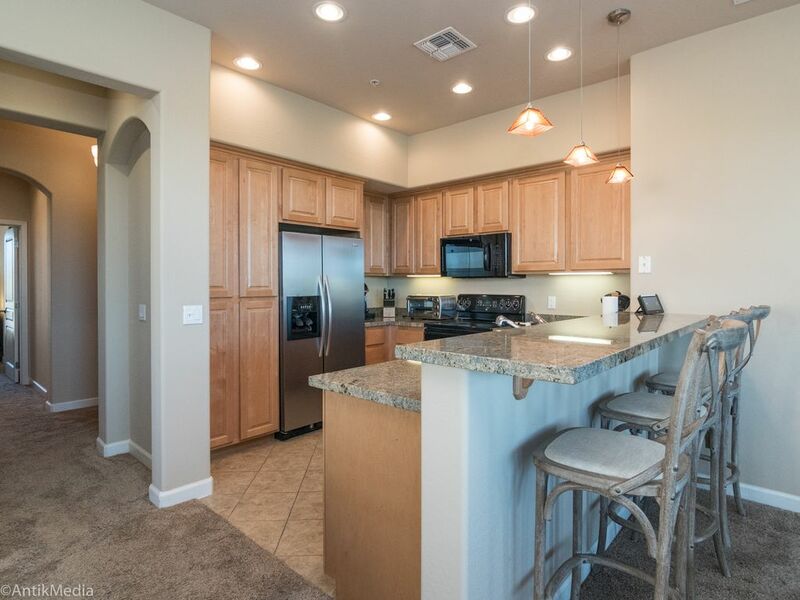 The updated condo is located close to Barrett Jackson, Waste Management Open, Kierland, Scottsdale Quarter and Mayo Clinic. It is also walking distance to the public Grayhawk golf and country club. We are willing to negotiate the rate for those who would like to rent this amazing condo as a long term rental. We are very excited to share our beautiful condo! Due to working in the winter months, we aren't able to enjoy it so we hope you will. This condo is available for long term rentals. Please contact me for rates and special pricing. We can also be flexible in timing of your stay. Howard fell in love with the view. It is so relaxing to sit on the patios and overlook the golf course and mountains. The property has all the amenities of home and a place where we would want to stay if we were traveling. All new furnishings and decorated with Restoration Hardware furniture and linens. The view is the best in all of Grayhawk and the location is ideal to walk to dinner and golf. Stayed in this unit for the month of January. Upon arrival, everything was in perfect condition and the owner had even left us some treats and a cupboard full of coffee. We didn't have a single issue with anything in the unit. Moreover, it is perfectly situated in the Grayhawk Community, near to great restaurants, shopping and golf. You will especially love the unbelievable sunset views every night looking over the 18th hole of Grayhawk's Talon course. Overall, one of the easiest and best rentals we've ever done on VRBO. This was by far the best equipped condo we have stayed in. There was nothing that we needed to buy other than food. The views from the main balcony and the bedroom balcony were amazing. We took a lot of pictures of the beautiful painted desert sky. We will definitely be returning. The property was great! We loved the view of the golf course and the near view of Isabella's. The unit was extremely well stocked, better than any where we have stayed before. For us, the location in Grayhawk was central to everything we like to do while in Scottsdale. The owners were also excellent to work with and we hope to be talking to them again soon! Thanks for the memories! Very well furnished, with every detail included for our comfort and convenience, (down to the bowls of peppermint lifesavers). Very comfortable mattress, and soft linens. Everything was in working condition. Would definitely stay again. (Note: If steps aren't your thing, this is a second floor unit). Being from Michigan we have made several trips to N. Scottsdale seeking the sun and warmth. This was by far the best property we have rented. Quiet, clean and elegant with all the comforts of home. The view from the balcony was very scenic overlooking the (quiet) golf course below (three mule deer skipped below us one evening) with the mountains of central Phoenix in the distance. Walking distance to restaurants and groceries (or a 2 minute drive if you prefer) and the owners responded very quickly to any questions we had. Thank you so much for choosing us! We look forward to you coming back soon!!!! This spectacular condo has an amazing view of the Grayhawk golf course, walking distance to DC Marketplace and the Grayhawk Country Club. It is close to the 101, Mayo Clinic, Spring Training, Barrett Jackson, Waste Management Open, Kierland , and many restaurants and shops. There are miles of walking trails nearby. There is a fitness center and pool within walking distance of the condo.